This chair was in the Los Angeles County General Hospital in the 60's. I wish I new how it got to the Salvation Army thrift store in the tiny town of Monroe, NC in 2009 . Tools needed: Fabric, staple gun, screw driver and pliers for removing staples, scissors. Staple new fabric on. I covered the underside of the seat also because it had water damage and was gross. 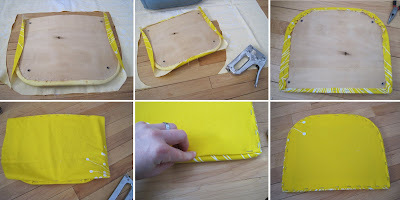 The chair back, step-by-step- 1) remove staples and vinyl & cut fabric a little larger then chair back. 2) Staple fabric on center of each side, pulling taut. 3) Continue stapling from side to side pulling fabric taut as you go. 4) Cut a square for the back. 5) Fold raw edge under and staple all around. 6) Fin! Wow! That fabric is AMAZING! I love the transformation! Such vibrant fabric. I love it. I haven't been in an Ikea store yet. I really need to. It's just not convenient, but the fabics look great for sure. LOVE IT! Love how you did the fabric on it...so great! Oh I love it! Love the fabric, I'll keep my eye out for a chair like this! 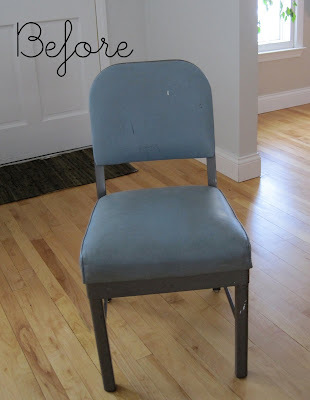 I did recover my plain cheapo office chair, wish I would have taken a before pic so I could share it! What a transformation!! I would have passed that chair by with out a second thought. You have such a great eye for thrifting! 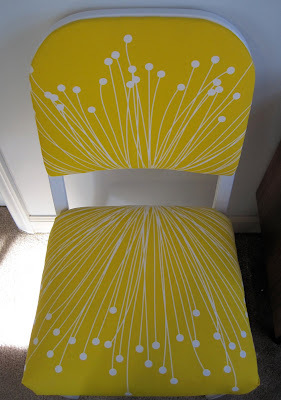 Yellow is my favorite color, but even if it wasn't, I'd still think this chair is AWESOME. Great job! That is awesome. That fabric really packs a punch. gorgeous! what a great redo! I really love the Ikea fabric. Was just there today and they were having a $2/yard sale! I'm kicking myself for not getting some! Love the happy yellow. Fantastic fabric choice fits with the chair's style. It could have looked like that all along! Love the fabric - it's so bright and happy. What an amazing transformation. That is WAY cool. The fabric is perfect for the chair... has so much movement, and you just have to take notice of that color. fabulous, Erin, you always impress me! Beautiful! The fabric is fantastic. oh my!!! i love it!! the fabric is sooooo GREAT!!! i'm soooo upset with myself for passing up that chair at our samaritan center although deep down i KNEW there was surely SOMETHING i could do with it!!! LOVE IT!!! Wonderful transformation! From depressing to happy! I LOVE ikea fabric too...well, everything there, but your chair is awesome! Love your blog!!!! I don't know how you find time to do a wonderful blog, and have 3 children, but GREAT job!!!!! You're definitely an inspiration to me!!! So, so cute! Yay yellow and white. rad rad rad. I don't think this chair could have revamped any better. Love it! Love this. And your color choices are spot on! This is gorgeous! The fabric selection couldn't be better. I don't think I'd let anyone sit down on something so pretty. I love it!!! Such a fun and happy fabric you chose. Wonderful! I think a doctor's wife stole it. LOL. I once bought a tray table that had the address label of the original owner. It was from the times when the zip code was three numbers! Love getting a little history with a piece! wow erin your skillz are amazing. I am so impressed with every single post. totally inspiring. We finally have out own home and I have no idea how to decorate it! I wish you could come over and help me!!!! That's amazing! I love it. I wonder if I can do something similar to the chair in my office. Thank you so much for sharing! Nice job! Gorgeous fabric too! that looks beyond fabulous. I am in love with that fabric! I love it! Isn't Ikea fabric just the best? We'd love to have you link up to We Did It! Wednesday on Sew Much Ado! I love your chair! 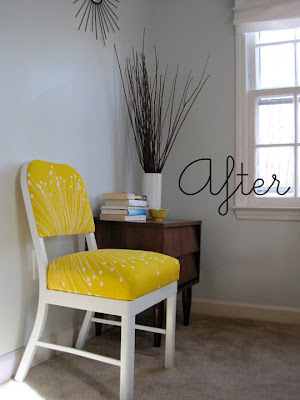 The yellow is perfect - so bright & Springy! Wow! I love the way you positioned the fabric. That's an energetic chair! You are so awesome! That looks like a chair that someone would pay $100 for! Thank you for the step by step instructions. I've always wondered how to recover a chair. Now I know what to do with these kinds of chairs!!! I always see them and my brain freezes. They are so, um, not pretty. Thank you for sharing. Please vote for my project GARBAGE TO GOLD at www.refresheverything.com. You can vote everyday throughout the month of April. Voting ends April 30th. I was searching out ideas for remaking my clothes and stumbled upon your blog and I love it! Thanks for all of the creative ideas! LOVE the fabric on this. I found similar old chairs from the Utah State Capitol and reupholstered them, the history makes them so more sentimental I think. I am in love with this chair-seriously. The colors, the design. It's absolutely gorgeous! This chair turned out very well indeed. It's success is due to the fresh lemon-clean colours and your way of strategically placing the fabric on the seat and back rest. This chair is a showstopper and could be featured in any house & design magazine. I so look forward to exploring your blog and to more of your transformations!